New Year's Eve Feast at Roy's Oahu! : Tigger enjoyed a top quality meal on New Years Eve that was completely unrivaled!! Tigger Travels - Family Adventure Journal Photos From Tigger`s Travels and MORE! New Year's Eve Feast at Roy's Oahu! 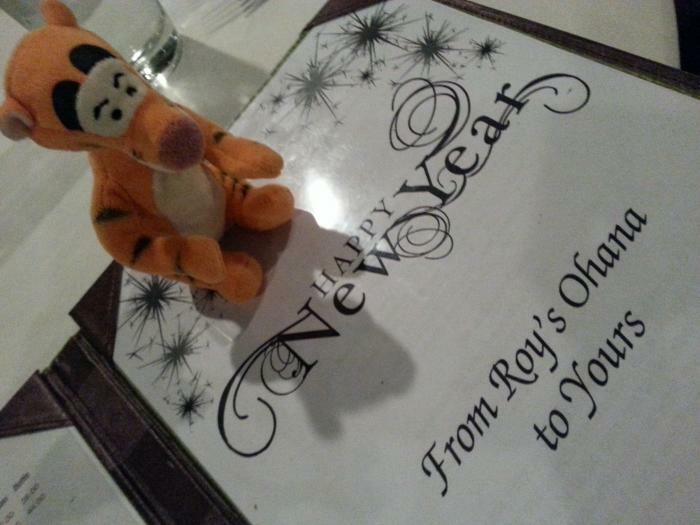 Tigger enjoyed a top quality meal on New Years Eve that was completely unrivaled!! 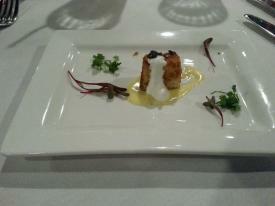 The menu offered that evening was a specially selected menu of items. 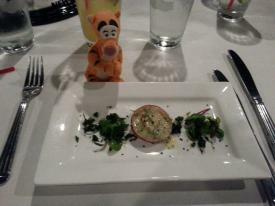 First, Tigger was served an Amuse Bouche. It was a grilled Naked Cow Buttered Brioche & Golden Osetra Caviar Hollandaise. Amuse-bouches are different from appetizers in that they are not ordered from a menu by patrons, but, when served, are done so free and according to the chef's selection alone. These, often accompanied by a complementing wine, are served both to prepare the guest for the meal and to offer a glimpse into the chef's approach to the art of cuisine. Macadamia Nut Brown Butter, Tender Mache, Crispy Fresh Fines Herbs. Smoked Ikura, Mao Citrus Pnozu. 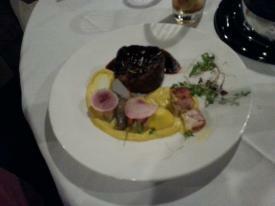 Pan Fried Red Bliss & House Bacon, Kona Lobster Essence. 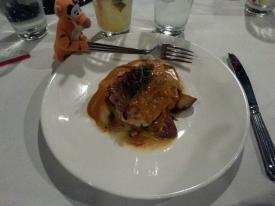 NOTE: When we ordered we were informed that when the Mahimahi arrived the chef was far less than amused. He rejected the Mahimahi and used another type of fish. 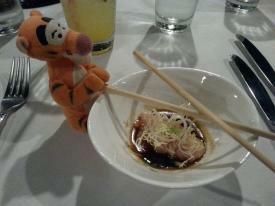 Needless to say, it absolutely MELTED in Tigger's mouth! So very good!!! Cauliflower Puree, Whipped Stilton, Lemongrass Cabernet. 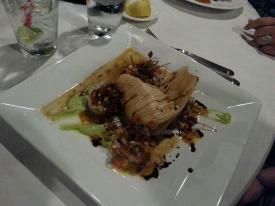 Creamy Avacado, Southwestern Tamale, Poblano & Chorizo Sauce. 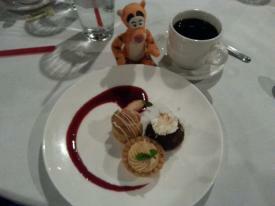 For Dessert Tigger was served a Dessert Trio. Peanut Butter Chocolate Tart (bottom), Molokai Sweet Potato Cream Puff (left), Demi Haupia & Chocolate Cake (right). At the top of this page is the menu offered for the night. The courses were all set except the Entr�e which guests chose from the available list Every meal was nothing short of INCREDIBLE!! !